Figure 1. Bedouin unrecognized village near Beersheba. The perception and treatment of a Bedouin Arab village that has existed for at least six decades and accommodates several hundred residents merely as an “open space” or “open area,” an Israeli version of the terra nullius doctrine, is a telling entry point to this book, in which we analyze the legal geography of the contested Negev (in Arabic, Naqab) region.8 Most Bedouin localities in this region are officially classified as “unrecognized” and “illegal,” and their populations are considered “trespassers” on state land. The lack of recognition of dozens of villages, though their inhabitants commonly live on their ancestors’ land, derives from state denial of the indigenous land regime that existed in the Negev before the establishment of Israel in 1948 and from Bedouin indigeneity. Since its establishment, the Jewish State has dedicated major efforts to securing its control over the land. In this framework Israel and its indigenous Bedouin citizens have been entangled in a protracted legal and territorial battle over traditional tribal land in the Negev region. This is the most intense and extensive land dispute currently taking place within Israel proper (i.e., excluding the post-1967 occupied territories). The heart of this land dispute lies in opposing conceptualizations of ownership, possession, and land use. On the one hand, the Bedouins claim land rights based on customary and official laws, possession and cultivation of the land for generations, and tax payments to previous regimes, which, in their view, should provide proof of ownership and be integrated into contemporary land laws. On the other hand, Israel, drawing on highly formalist and, in our eyes, distorted legal interpretations of Ottoman and British statutes, views all Bedouins residing in their villages as illegal trespassers invading state land. The Bedouins are often portrayed by the state as intrinsically nomadic invaders from other regions who survived well into the twentieth century as pastoralists and plunderers. As such, they did not acquire any rights to Negev lands. Their “illegality” is implicated in a number of situations, including criminalization, house demolition, and the treatment of their habitation areas as empty, thus deserving no state protection in times of war. Several maps illustrate some of this dispute. Map 1 illustrates the location of the Bedouin living area in relation to the entire Israel/Palestine region and marks the siyaj (sayag in Hebrew, literally “fenced”) region, into which all Bedouins were concentrated after the 1948 war. Map 2 zooms in on the Bedouin regions around Beersheba, including our main focus of the ‘Araqib area, which lies some 10 kilometers north of Beersheba. It shows the spatial pattern of Bedouin informal (mostly unrecognized) localities, where more than 100,000 Bedouins resided in 2016, and the seven planned towns into which the state attempted to urbanize the entire indigenous population of the region in the past. Map 2 zooms in on the land claims of the tribes in and around ‘Araqib. 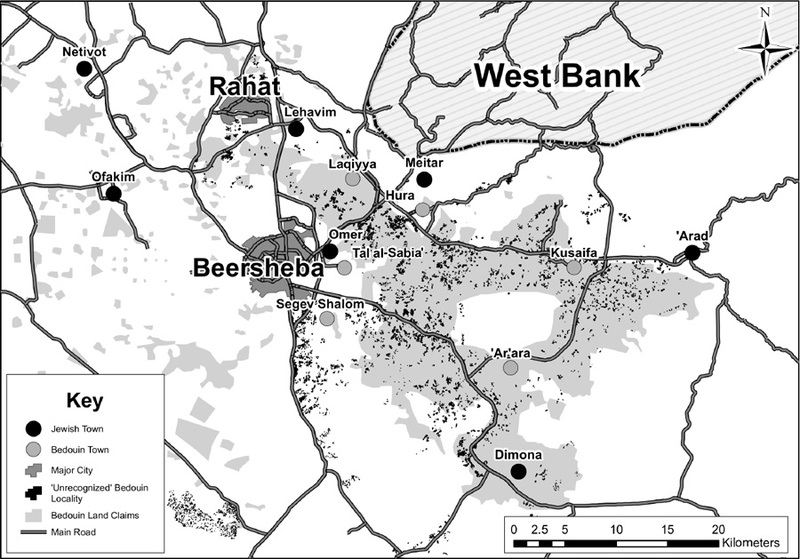 Map 3 provides further necessary background by showing the extent of Bedouin land claims and current “unrecognized” development in the Beersheba metropolitan region. As will become clear in the following chapters, contrary to state claims, Bedouin Arabs have resided in the Negev/Naqab region of southern Israel/Palestine for centuries before the establishment of Israel, subsisting on a mixed economy that combined pastoralism and agriculture. Map 1. Location of Bedouins and the siyaj region in Israel/Palestine. Source: adapted and updated from Avinoam Meir, As Nomadism Ends: The Israeli Bedouin of the Negev (Boulder, CO: Westview Press, 1997), 114. Map 2. 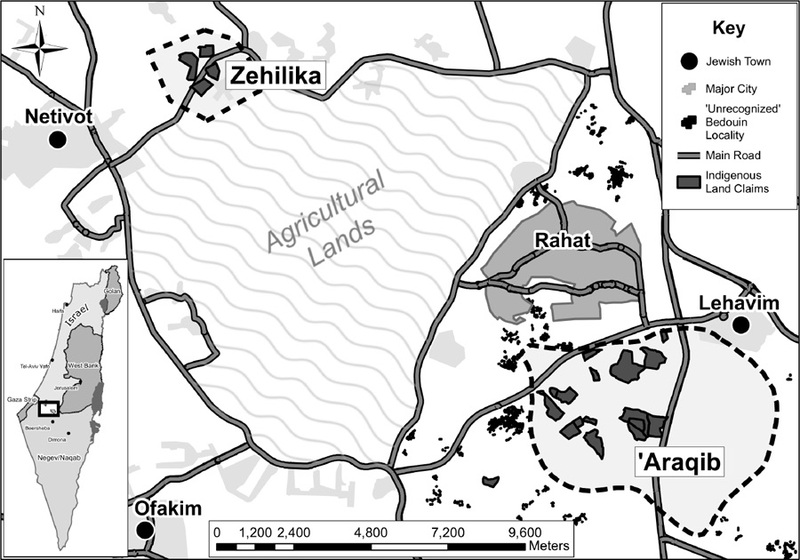 Location and land claims of al-‘Uqbi in ‘Araqib and Zehilika. Source: al-‘Uqbi archives and the Israeli Land Authority. Map 3. 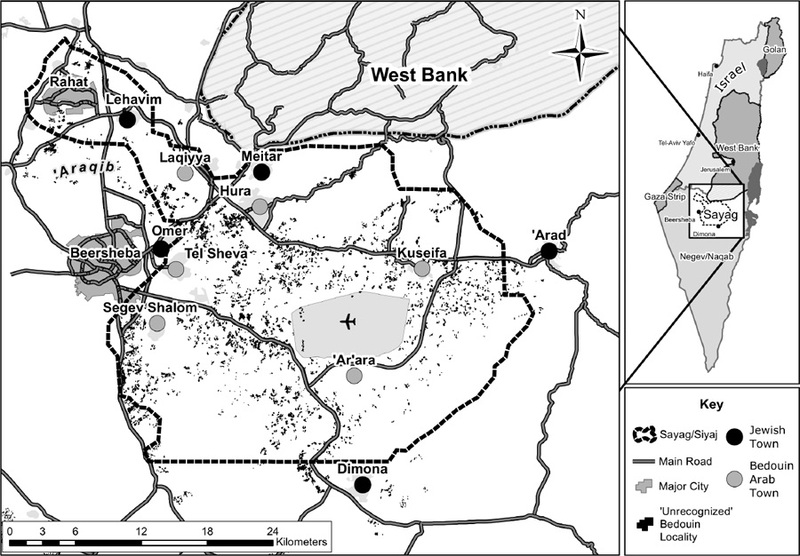 Bedouin land claims and the unrecognized Bedouin localities. Source: Regional Council of the Unrecognized Villages, aerial photograph 2015; and Israel Land Authority. Throughout the past several centuries, the Bedouins, like other indigenous peoples, developed a distinct land regime that regulates their settlement system and self-rule over property, including ownership, division, sale, and conflict resolution. Since the 1970s, despite their partial urbanization and incorporation into the Jewish state, the Bedouins have continued to hold to many aspects of their traditional culture, customary law, and social organizations. Their settlement system, based on traditional patterns of landownership, is still in place in the north, northeastern, and central Negev, where the unrecognized localities exist. 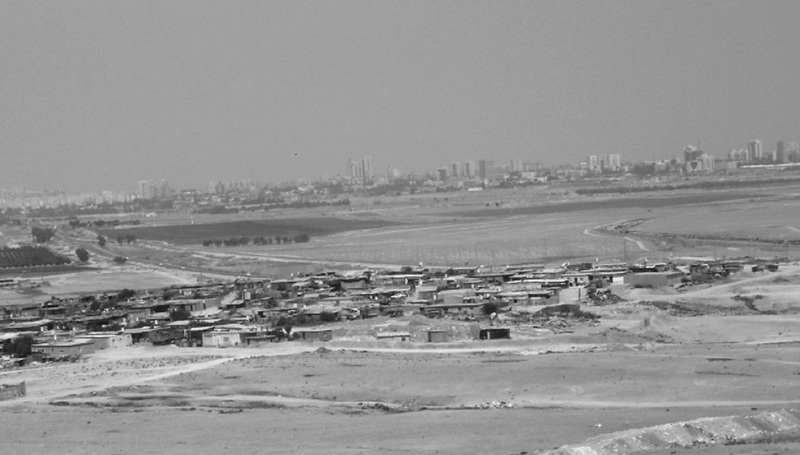 In other parts of the Negev, Israel has evicted and destroyed most Bedouin settlements. 2. As we explain later, in our context the term unrecognized localities refers to Bedouin settlements that, according to the official Israeli position, are located on public land and were built without permits. These localities do not appear in official maps or plans. 3. Elisheva Goldberg, “Israel’s Bedouin: Caught Between the Iron Dome and Hamas,” The Atlantic, August 1, 2014, tinyurl.com/kzkr3pp (accessed June 3, 2017). 4. Chaim Levinson, Ido Efrati, Jack Khoury, and Revital Hovel, “Man Killed in Rocket Strike on Negev Bedouin Community,” Haaretz, July 19, 2014, tinyurl.com/mjvjm6v (accessed June 6, 2017). 7. H.C.J. 5019/14 Abu Afash v. GOC, Home Front Command, Petition for Temporary Injunction (July 16, 2014), par. 7, 11 (Hebrew) (copy with authors), and Defendant’s Response (August 17, 2014), par. 17. See also Revital Hovel, “High Court Rejects Petition Seeking Rocket Shelters for Bedouin Villages Now,” Haaretz, July 21, 2014, tinyurl.com/zrzqa2u (accessed June 6, 2017). 8. On terra nullius, see Sections 1.2 and 1.5; on legal geography, see Section 1.1. 9. See Ahmad Amara, “The ‘Negev’ Redefined,” paper presented at the New Directions in Palestinian Studies Workshop, Brown University, March 2014 (copy with authors). For the historical geography of the region, see Chapter 5.